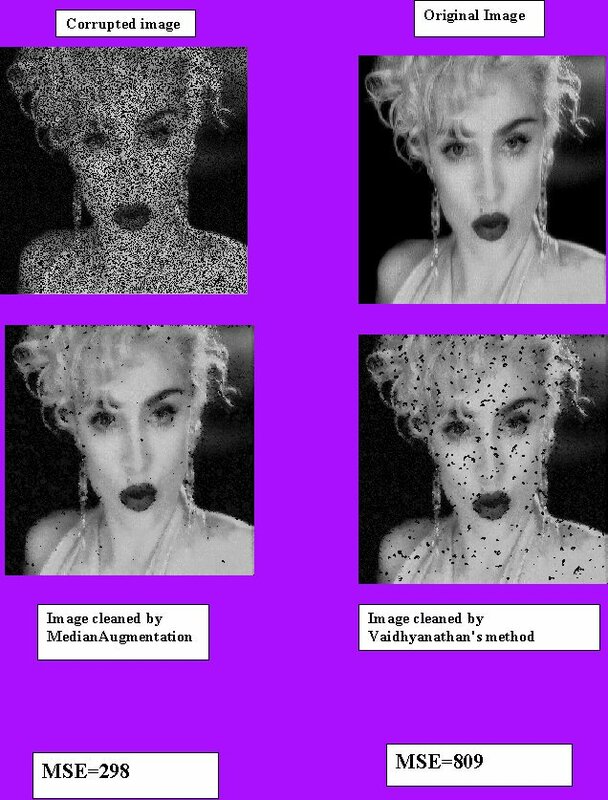 This page contains information about some digital image processing work that my friend Prasanna and I did during the 7th semester of our undergrad studies. We developed a new technique for cleaning images corrupted with pepper noise. We called this method MEDIAN AUGMENTATION". This is actually a good example of serendipity wokring overtime. Prasanna and I were actually working on our homework assignment for a digital image processing course and while doing our matlab simulation...we made a mistake in our code and it actually produced much better results than it was supposed to. We then went back looked at the bug in the code, figured out what it was doing and generalized it and voila: Median augmentation was born. This paper won the 2nd prize in an All India Paper presentation competition held by the Indian Institute of Technology , Madras. It also won the first prize in several other paper presentation competetions in India. Here's an example of the Performance of Median Augmentation. The other method (we called in Vaidhyanathan's method after the author who developed the algorithm) used for comaparison actually belongs to class of noise removal methods called the contra-harmonic mean methods.